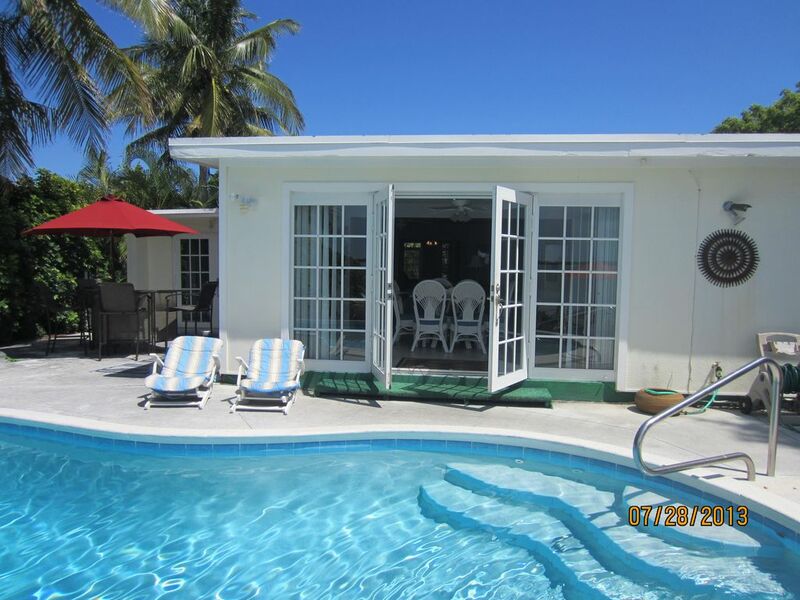 Ocean front 4 bedroom, 2 baths villa, with in-ground heated pool 15 M from KW. Unwind in the Beautiful, Tropical Paradise of Key West, in the Renowned 'Southern Comforts' 4 Bedroom Ocean Front Villa, in the Peaceful and Serene Environment of Bay Point on Lower Saddle bunch Key. Only 15 Miles Away is the Exciting, Eccentric and Much Beloved City of Key West, with its Many Attractions. But Before You Explore This 'Southernmost Tip' of the Us, You Are Seduced by the Comfort and Beauty of Your Vacation Home. the Beautiful, Designer Inspired But Comfortable and Charming Southern Comforts Villa, with a Magnificent Open Floor Plan Opens to the Ocean Front Space and the Large in Ground Heated Pool, Via Three Sets of French Doors. the Property Has Four Lovely Bedrooms; the Master Bedroom Opening to the Ocean Front Via it's Own Set of French Doors. The Master Bedroom has a large Master Bathroom. There is an Additional Full Bath Comfortably Located Between Two of the Guest Bedrooms. the Kitchen Has Been Recently Remodeled, as is the Rest of the Property, to Include Designer Cabinetry and All New Stainless Steel Appliances, with a New Dishwasher and Built in Microwave. the Designer Inspired Tiling Throughout the Home, Reflects the Care and Thought and Effort the Owners Have Invested in the Extensive Remodeling Project of the Property. and Now, Humming Along with the Jimmy Buffett Tunes on the Stereo; You Sit by the Beautiful, Large, in-Ground Heated Pool on the Ocean Front, Sipping Your Own Personal Recipe for the Definitive Pina Colada, as You Watch the Magical Sunset of the Florida Keys! the Pool Has a Patio Adjacent to it; Making it an Ideal Location for Pool Side Dining and Entertaining. However, If the Lure of the Open Water is Too Powerful to Resist, You Stroll Down to the Ocean Front Tile Patio and Dock Via a Few Gently Sloping Gracefully Curving Sets of Stairs. There You Will Find, Not Only Another Level of Possible Space for Dining and Entertaining, But Also Our Much Featured 'Sunset Swing' Under a Gently Swaying Palm Tree. Heading North, Toward the Lovely Keys of Summerland and Big Pine Key with it's World Renowned Diving and Snorkeling Sites and the Key Deer Reserve or South, Toward the City of Key West, You Will Find Numerous Charming Ocean Front Dining Possibilities and Some Wonderfully Eccentric Restaurants with Great Sea Food and a Delightful Cast of Characters Serving You! Margaretville, Jimmy Buffett, Ernest Hemingway, Tropical Sunsets, Swaying Palms and the 'American Caribbean' What Could Be Better Than This! Central air throughout the home and individual wall units in three of the four bedrooms provided as well, for personalized sleeping comfort. Ceiling fans in every bedroom. High efficiency, compact, large capacity Samsung appliance. Driveway, off the street parking. Max high speed internet, wifi enabled. Large, open, tropical style space with pool and Ocean view, comfortably furnished with a Caribbean theme. China wear for inside, and plastic poolside dishes and drink ware provided. Dining area has a view of the large in-ground pool, the patio, the dock and the Ocean. Variety of fiction, non-fiction, poetry and historical volumes for guests. Professionally maintained tropical landscaping, affording rarely available privacy in the Keys. Ocean front patio and dock for dining and entertaining. Lit tennis courts within walking distance. Large, heated, ocean front in-ground pool, professionally maintained. Beautiful, open space design, ocean front home. Large, professionally maintained, heated, in-ground, ocean front pool. Tropical, and professionally landscaped Ocean front setting, affording the very rarely available privacy in the Keys. Gorgeous, fabled Key West sunsets, with comfortable patio and deck furniture for seating and entertaining. The home is located in a quiet, residential area; offering a peaceful respite after a fun filled day in downtown Key West, only 15 miles from the property. What a an amazing experience! The sunsets are worth the price of admission! Beautiful home, open spaces inside, beautiful views and on the Ocean with a large heated swimming pool. The ocean front backyard with the pool is more private than any property we have sceseen in the Keys! The backyard has multiple places to hang out; pool side, dock, off the dining room with very comfortable seating and a large patio table. More than adequate amenities. Fun places nearby, and although only 15 mins from the noisy activity of down town, it is a quiet residential neighborhood. Will be coming back! For many people, it just doesn’t get better than a holiday in the Florida Keys. We’ve been going, on & off, for the last twenty years, and each time we’ve refined our choice of accommodation. This year we really hit the jackpot with our stay at Villa Southern Comforts in Saddlebunch Key. Without a doubt, the best feature of the location is that the villa is on the sunset side of the Key. There’s no need to trek down to Mallory Square – just enjoy the most amazing sunsets from the privacy your own back yard – the drinks are cheaper too! Secondly, an excellent local Realtor professionally manages the property. Payment was easy and secure, (often a problem from the UK) there was a point of contact during our stay and nothing was too much trouble. Finally the villa itself: Previous reviewers who have focused on the wear & tear that rental properties acquire over time have, I believe, missed the point. This property’s outstanding feature is the pool. It is completely secluded and as private as you are ever likely to get in the Keys. Everything else was in working order, but even if it hadn’t been – with a pool that good it would have been churlish to complain. Easy access and a sense of security combine to give a real feel-good quality to the property that turns a good holiday into a great one. In short – we loved it, and are already planning our return trip. Thank you so much for taking the time to share your experience while visiting our property, the Villa Southern Comforts. We are delighted that you enjoyed your stay and took advantage of the outstanding amenities of the property, such as the private setting, the sunsets and the advantageous location to Key West and the many attractions in the area. We look forward to your return visit! We too found paradise at Southern Comforts. This year we returned for our second stay and we enjoyed it even more this year than last year, which I would not have thought possible. The pool was as ever PERFECT, there is new patio furniture which is lovely, and the grounds were well looked after and ideal for watching the amazing wildlife. We fed the fish every day from the dock and by the end of the first week we had a very full aquarium. The neighbours and neighbourhood are great, the house is the perfect distance from Key West and very comfortable. We just can't get enough of this place, we already miss it. I'm no John Milton, but this must be the case for Paradise Lost and Paradise Found! We read with some concern the January guests' review, but we did not find any of the few issues they listed as concerns. Our family are annual snow bird visitors to the Keys, and we like to splurge on our vacations so we rent high end properties. This has proven to be far superior to the newer "lux" properties we have stayed at. It is an older typical Key West villa, well maintained without the cookie cutter look and feel of the newer stilt structures. The back yard fronting the ocean has the privacy that we have not experienced with the newer properties.I am a rehab guy, but I did not find any of the wear and tear issues described by the January guests. The bathrooms are more than adequate, and the caulking around the tubs the guests complained about were clearly professionally done. Also we did not have any connection issues with the WiFi. It was fast and very reliable. The patio furniture the guests complained about being worn, was actually seemingly brand new, with an oversize patio table and very comfortable swivel type dining chairs. So maybe the owners have addressed the issues. There was a very useful info folder about the property with several pages of the owner's personal recommendations for dining and entertainment in the area. In fact the pool guy is a recording artist with several CDs and we heard him perform at a local venue. Great fun! Terrific fishing off the dock and more than one evening we had fresh caught grouper grilled outside as we watched the sunset from the pool! Actually quite a bit larger than most of the other pools on the newer properties. We had great weather, and since we follow the weather in the Keys, we know that this past January was unusually ugly, with rain, cool winds and overcast skies. Perhaps that also added to a bit of the disappointment for the January tenants. We found the property manager, Deirdre to be warm and welcoming and responsive and accessible. So the January folks experienced Paradise Lost, but for us Paradise Found! We are looking forward to not searching anymore for the Keys paradise, and coming back to Southern Comforts. Thank you so much for your informative review. We are very happy that you enjoyed your stay at Southern Comforts. You described so well the advantages and the amenities that the property has to offer, in such a balanced, informative and objective manner. We consider our property a work in progress, as I believe all rental property owners should, and as such we are committed to continually improving Villa Southern Comforts to enhance the quality of our guests' experiences. We welcome your return visit as your plans allow. Great neighbourhood and home. We thoroughly enjoyed our stay as did our family. Our grandchildren enjoyed the pool which is close to the house and easy to supervise. Fishing in the channel from the dock was good .. shark, barracuda, grouper, plus others .. you will have to buy chum to attract these. While the view and gardens are quite nice - the property is in need of a lot of TLC. Our stay was for a month. We were on a working holiday - and that was the first problem. The promised WIFI was a problem from the start. We struggled with it daily as it was MOSTLY down. It remained unsolved by the Management of the property, and we found an alternate solution ourselves. The bathrooms were both worn and in need of updating. The outdoor furniture, which is most important as that is where you want to be - was in very bad repair. A bar set and stools were literally duct taped together. We did not want any one hurt so we removed this whole set to the side path to avoid any more breakage. Although there were lots of cupboards in the kitchen, the upper shelves in the cupboards kept falling. My husband repaired them a number of times. The double doors - most of the locks were obviously rusted inside and very difficult to lock. Many of the blinds on the windows were broken and bent. We had a problem with the pool, but upon calling the pool man, he did come quickly to repair and correct. The DVD player wouldn't open properly. We have rented a number of years and all of the other rentals contained a "book" with house directions, property info, local restaurants, etc. Always very helpful. There was nothing in this home. I suggested it to the Property Manager and they said they were working on it. It never arrived during our month's stay. This property has the potential to be WONDERFUL, but it needs some major attention. The property manager was slow and sometimes unresponsive altogether, to answer most of our questions or address our problems, which was also discouraging. For the rental cost of this property - I would not recommend it. Thank you for making the effort to share your feedback. We are very sorry that you were disappointed with your stay at the property. We always welcome constructive feedback that can improve the quality of a holiday in the Keys. We do our best to address the issues presented by our guests. Thanks again for taking the time to write your review.